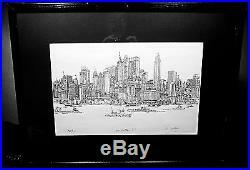 Beautiful, highly detailed, framed art drawing of Manhattan in 1967 (limited 167/200) by Richard Welling. Beautiful artwork in great condition (frame & picture) with only very minor wear to the frame back covering. 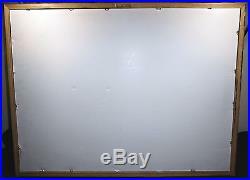 This limited framed artwork measures about 25 x 19. And it shows a splendid view of Manhattan, shortly before construction began on the World Trade Center (in 1968). IMPORTANT INFORMATION: The first picture is the closest to what it actually looks like, since it's only black & white. And I don't have one of those expensive high-end cameras, nor do I have a professional photography art studio, so please excuse the glare from the glass. SHORT BIOGRAPHY OF THE ARTIST. Richard Welling, 83 (August 21, 1926 to November 5, 2009) was born in Hartford, the son of William and Muriel Welling. After serving in World War II in Europe, he studied at the Parsons School of Design in New York, graduating in 1949. He began his career first as a commercial artist and later as a fine artist. He chronicled the cityscape of Hartford in intricate line drawings that became his signature style. He also loved New York City and drew its skyline. A major project was drawing stages of construction of the twin towers at the World Trade Center. After the tragedy of September 11, 2001, Richard donated a number of these drawings to the New-York Historical Society. Recently, one was included in the exhibition Drawn by New York, Six Centuries of Watercolors and Drawings at the New-York Historical Society. Richard published numerous collections of his drawings and wrote and illustrated two books on drawing techniques. GREAT LIMITED ARTWORK BY A RESPECTED ARTIST. 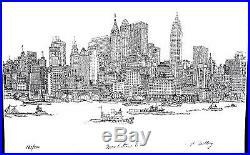 The item "Manhattan New York 1967 Richard Welling World Trade Center Pre-Construction Art" is in sale since Thursday, April 13, 2017. This item is in the category "Art\Art Prints". The seller is "rose_city_books" and is located in Portland, Oregon. This item can be shipped to United States.